While closing his back door with one hand and cradling two pre-split logs in the other, Pete Sveen didn’t see the car that was ascending his quarter-mile-long driveway. 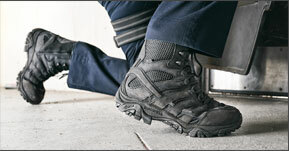 Before he placed the wedges in the fireplace, he laid them on the floor, stomped the snow off his boots, and removed his coat. That was when the unexpected knock came on his door. Pete was used to people visiting his modest, split-level ranch which resides on a 10-acre property in the Gallatin Valley. This knock, however, was unexpected and at the same time, he knew it would eventually happen. Pete opened the door and immediately felt the single-digit Montana temperature reach inside and sweep across his tightly cropped dark hair. A married couple, bundled in midlayers–warm enough for the frigid air, but not too restrictive for sudden movements–stood on the snow-covered wooden steps. What they carried in their hands more than revealed their intention. Pete did not recognize the strangers. They knew of Pete only through stories from the Bozeman locals, which already traveled fast in his community, but which increased in velocity over the last month. The same could be said for the Instagram posts, which reached out and captured attention from a wider audience. Without so much as a word spoken, Pete knew what they wanted. As such, Pete invited the couple into his home without hesitation. To make the scene more comfortable for his surprise visitors, Pete returned to the pre-split logs. He swung open the single hinged cover, inserted the wood vertically into a cylindrical matte black fireplace, the top leaned in first. Once cleared, he rotated the fuel horizontally to a resting position over the embers. Behind the fireplace was four vertical glass windows that offered a clear sight line to the North. The middle panes could open up to a deck, if the deck was in fact built: a future project for Pete, who has gained a YouTube following as a Do-It-Your-Self video host known as “DIY Pete”. His channel features step-by-step videos on various projects including making a sliding barn door, a farmhouse table and a patio cooler ice chest. His newest passion is using concrete to build countertops illuminated with underlaid LED lights. The addition of the four windows was a recent renovation in his house to expose the view of the Bridger Mountains. The framing studs and header are still exposed and yet to be covered in sheetrock. 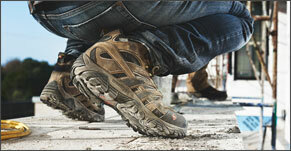 Despite being rough framed, the joints are tight and reveal a high level of craftsmanship. The visitors, however, are not interested in the house, his garage-based shop or even his YouTube channel. They—like many of Pete’s friends, family, and the entire Bozeman community—are eager to see what lies about 100 yards behind the house: his latest DIY project that is garnering attention and conversation. Pete anticipated the question. He then went over to a control placed on his custom concrete kitchen island and remotely illuminated four LED lamps 100 yards behind the house through a Wifi connection. To Pete, the unexpected visitors are a first, but they are not an inconvenient distraction but more of validation. It was, after all, the very reason he built the hockey rink in his backyard. Pete throws on the same coat he had just removed and leads the couple out the back door. 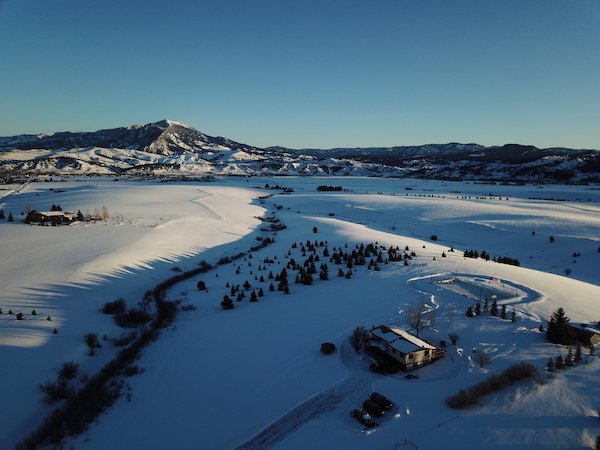 From the property, it is a magnificent view that combines snow-covered mountain peaks, the rolling snow-draped valley, and the magnificence of Big Sky country. In front of it all is a hockey rink that Pete constructed just two months before. 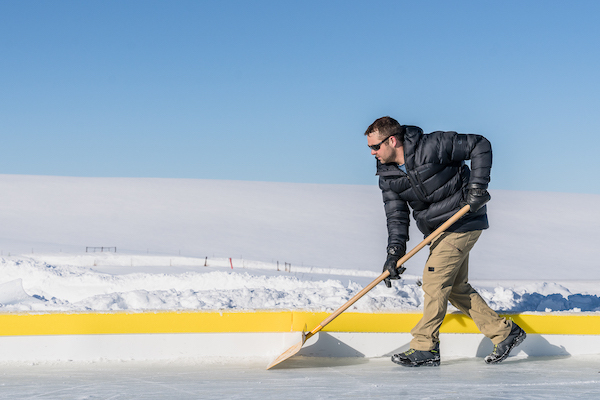 He maintains the frozen surface daily with the sole intention of bringing people together, no matter if it is friends, family, or even strangers. The couple, who are no longer strangers after a few mere minutes of friendly banter, cannot believe the scene and immediately lace up their skates to indulge in a moment that is as much magical it is as spiritual. Dyersville, Iowa, a town with a population of 4,035, is lesser known for having the National Farm Toy Museum. The city, which straddles two counties, has more prominent renown for a baseball field in the middle of a cornfield. When illuminated at night, the baseball field, which served as the backdrop for the movie, “Field of Dreams,” starring Kevin Costner, Amy Madigan, Ray Liotta and James Earl Jones, serves as a beacon that draws in the aged and old, and the latter who have their youth restored even if only in spirit. Pete grew up in Aberdeen, South Dakota, which resides 567 miles from Dyersville. He knows his rink in Montana has the same effect. 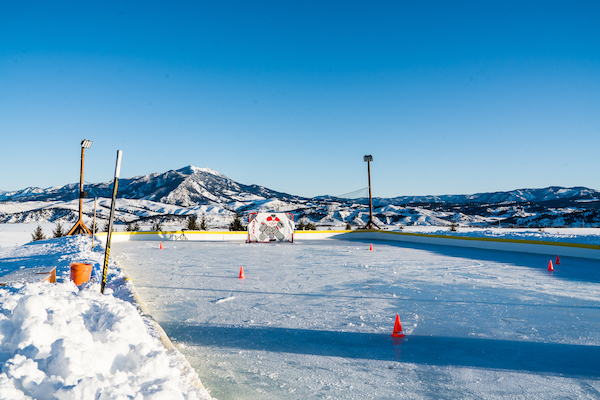 “This is definitely my rink of dreams,” he said. Pete Kamman grew up in Chicago, 208 miles directly east from Dysersville. He also understands the comparison. 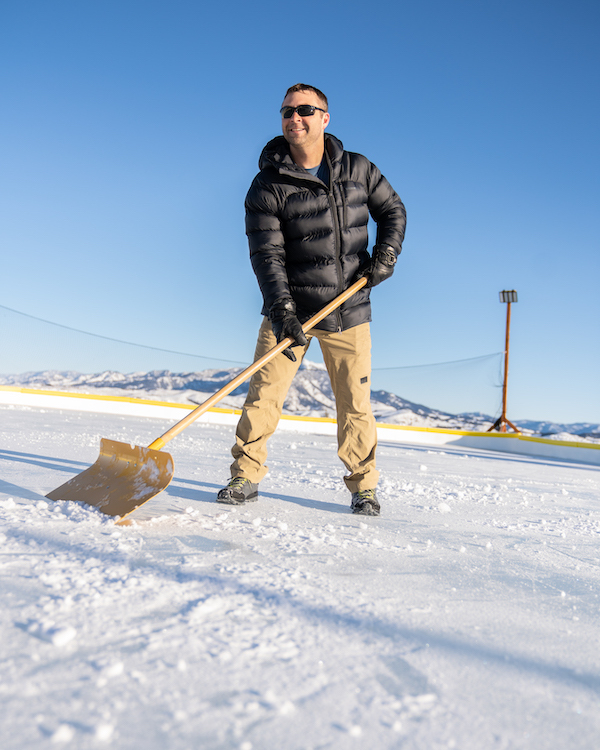 As a former collegiate hockey player and currently a coach at Montana State University, Kamman is as drawn to the ice as anyone. 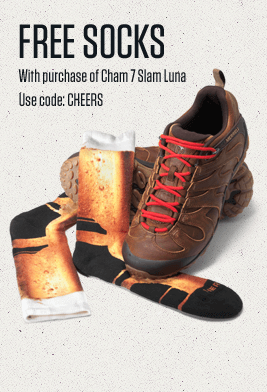 Friends within the hockey community scattered across North America inquire about the special spot. 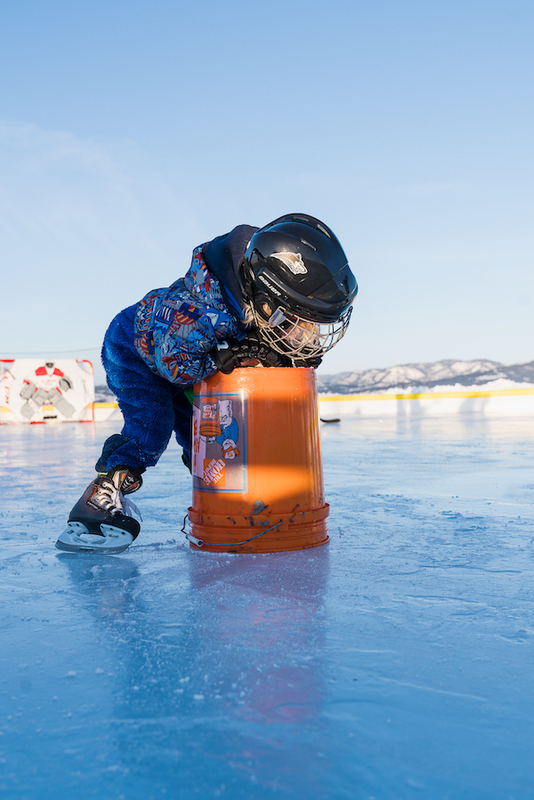 When he first heard about the rink, Kamman’s mind quickly jumped to two possibilities. The Bobcats, the university club hockey team who compete in the Mountain West Division of the ACHA, took advantage of the opportunity. “We did a blow-off-steam skate for the team in the middle of final (exams),” Kamman said. “Pete was a gracious host, and we had a great time. The rink itself has gained notoriety throughout the country partially fueled by Instagram posts. Kamman thinks this has given more credibility for hockey in Montana. The rink has given the Kamman family a more indelible frozen moment. “I have been out here a bunch with my two boys, Danny and Brooks. The first time I have been able to get my three-year-old Brooks skating was a month ago. To do that was a pretty special thing. Jackie Nourse grew up playing sports. Being from Tahoe, she is an avid skier and played multiple sports including soccer, running track and cross country, and she even dabbled in basketball. Secretly, she desired to play ice hockey but had never followed through on the interest. Then, she heard about her friend Pete constructing an ice rink. “When Pete built the rink, I decided to buy a pair of skates,” Nourse said. Nourse lept at the first opportunity to skate on the new rink. She started with some slips and falls, but Pete graciously dedicated a training session with Nourse and helped her reach a comfort level on skates that led to another big decision. “I was a little shaky when I first hit the ice,” Nourse said. “Pete spent an hour and a half with me teaching me things about hockey. It was almost like a private lesson. It was so cool, and I picked it up fast. “She had a couple of falls, but by the end of the night, she was dribbling the puck around and was confident and feeling good,” Pete recalled. Nourse originally moved to Bozeman 15 years ago and returned permanently eight years ago. As a travel influencer who maintains two blogs and hosts a podcast, she admits to chasing summer—that is, leaving the Big Sky country during the winter months to lead adventure trips to places like Patagonia, Ecuador, and Jordan. That was before taking up hockey. Now she is not so anxious to get away to warmer destinations. Pete has a strong desire to bring people together. That is where the idea for New Year’s Eve originated. So, when the weather called for -10 air temperature when the calendar closed out the final clock ticks of 2018? 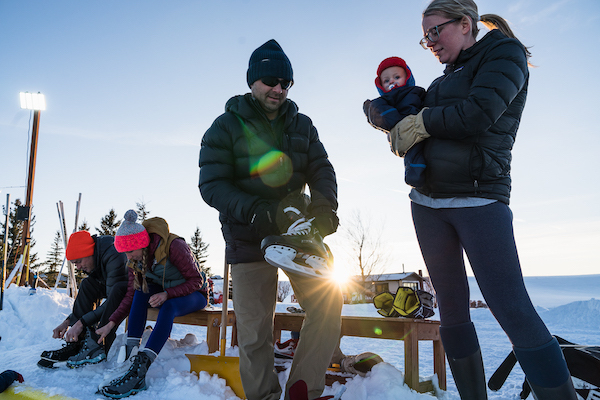 Sub-zero temperatures couldn’t dampen a unique chance to usher in 2019 in hockey skates under the stars. There were no fireworks or even a ball drop. But for the 32 people on Pete’s property, there was perfectly chilled champagne with music piped into outdoor speakers Pete wired up with the mountains in the backdrop. Like Rising, Nourse was surprised by the unconventional approach to the holiday celebration. 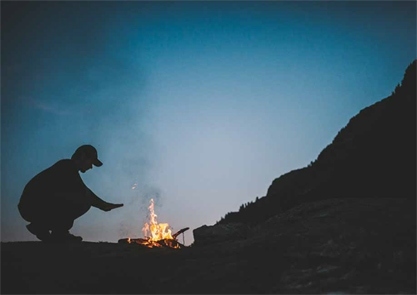 According to Nourse, the midnight gathering was just typical Pete—another of one his ways to get people together with yet another do-it-yourself project. Just moments after the clock struck midnight to usher in the new year, it was time for another decision to be made. The rink has to return for a second year. “Immediately after New Year’s was over, everyone was like OK, so we all know who is hosting New Year’s next year,” Pete said. Rising grew up in Sault Ste. Marie in Ontario, Canada. 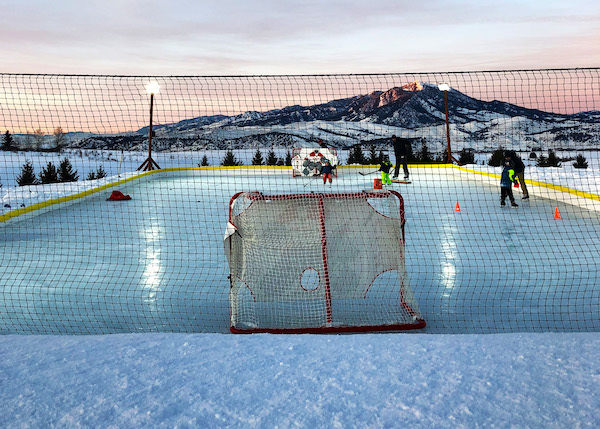 Being amid hockey country–she shares a hometown with NHL Hall of Famers like Phil Esposito and his brother, Tony, and Ron Francis–Rising is used to frozen ponds and makeshift rinks. What Pete made transcends them all. As to what Pete could do to make it better? “I don’t know what you could change other than make it bigger,” Rising said. Not only will the rink return in the fall of 2019, Pete has even grander ambitions. He envisions making the ice surface longer and wider. Possible additions include a warming hut, with the kids in mind. Of course, his DIY background has inspired another innovation. Tinkering, it turns out, could either be genetic or at least passed down through experience. Pete learned it at the side of his father growing up on the family farm in Aberdeen. It’s where his carpentry and metalworking skills were mentored at his dad’s side. Montana was a big part of Pete’s childhood. Frequent trips to visit family and time in the mountains—Bozeman is a short drive to Yellowstone National Park—left a big impression. From South Dakota, Pete traveled south to pursue his collegiate degree at the University of Nebraska at Lincoln. He felt Montana, and the opportunity to pursue outdoor adventures were calling him. Tinkering also beckoned him. He started building projects for friends and documenting the process on video. He began sharing the videos on YouTube and gained a following among fellow and aspiring DIY’ers looking for some tips of the trade. Desiring another project, he bought a house in need of repairs. As a child, Pete had helped his father build an ice rink in their backyard. He knew in the back of his mind that as a hockey player who plays in a local recreation league, he wanted to replicate that experience of skating under the stars. Moreover, he wanted to find a way to help the winter move faster and bring people together. Pete not only built the ice rink, he even went out of his way to scour the local used sporting good stores to buy hockey skates and sticks. That way, no barriers or excuses exist for friends, family and the occasional stranger, to enjoy the scenic location and experience. Building the rink was one thing. 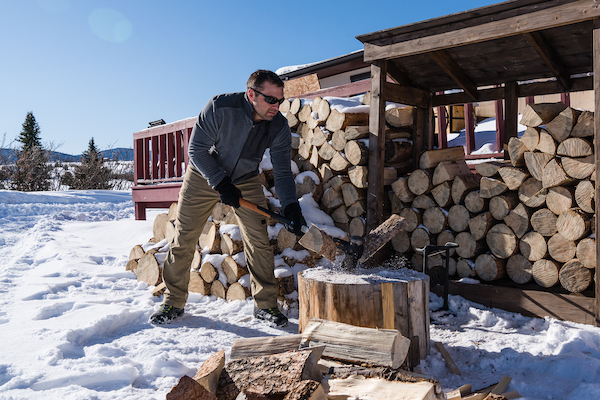 Maintaining it with the winter weather that Montana throws at him is another. 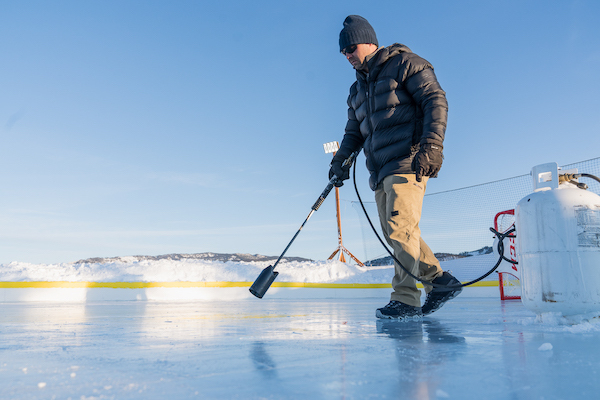 It’s a daily cycle of maintenance from using a snowblower to clear the ice, using a makeshift Zamboni to add a layer of water to freeze, and applying heat through a propane torch to smooth out rough spots on the ice. When she first heard about Pete’s plans, Nourse knew Pete would build so much more than just a hockey rink. Rising echoed what many locals have said. The rink is something special. Those who have had the privilege to step onto the ice and glide down the rink feel compelled to share their experience. The rink itself sees regular use from young kids to 3-on-3 pickup games every Tuesday night. “This is a small thing I can do to bring people together,” Pete said. “It is rewarding. I built this from scratch. Now there is this ice rink that so many people can enjoy. Our community can come and use this, and I think it is something that will be here for years to come. He will just have to be ready for a few more unexpected knocks at the door.